The continental shelf, the transition region between the coastline and the deep ocean, is literally where society meets the sea. It is within this coastal ocean region where maritime commerce takes place, where commercial and recreational fisheries are situated, and where environmental concerns, such as harmful algae blooms, abound. Knowledge of the coastal ocean circulation is fundamental to the understanding and predicting coastal ocean property distributions and how these impact ecological processes because the circulation is what unites nutrients with light, thereby setting the stage for all trophic level interactions. Yet, the circulation is difficult to define. Driven by interactions that occur both between the shelf and the deep-ocean and the shelf and the estuaries, along with local forcings by winds and buoyancy fluxes, the coastal ocean circulation varies over a broad range of scales. Measurements of sufficient duration and spatial extent are necessary to distinguish among these different scales of motion and to estimate long-term means. The mean circulation on the West Florida Continental Shelf is described using long-term current measurements. Bounded by the Florida peninsula to the east and the Gulf of Mexico to the west, the West Florida Continental Shelf mean flow is oriented approximately along-isobath and southward. The mean velocity vectors veer systematically with depth, shoreward over shallow water and seaward over deeper water. This polarization change implies that the mean flow is upwelling over shallow water and downwelling seaward from the inner shelf. Such a well-organized, threedimensional coastal ocean circulation pattern, revealed by an unprecedented set of observations, and explained on the basis of wind forcing and density field adjustment, has important implications for both fisheries and red tide occurrences. More details can be seen in Weisberg et al. .
Also see seasonal viability of the currents on the West Florida Shelf. Weisberg, R.H., Y. Liu, and D.A. 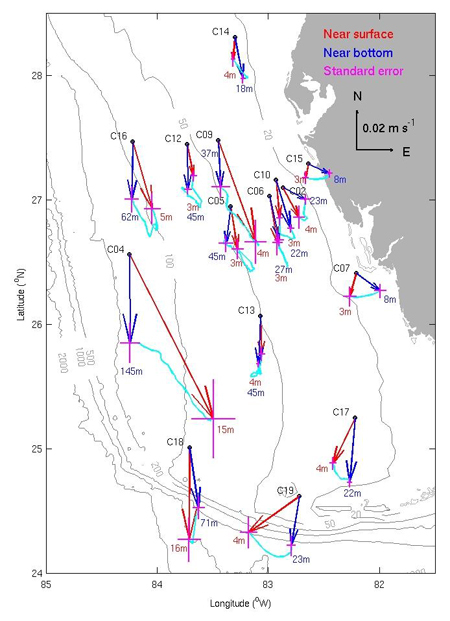 Mayer, 2009: Mean circulation on the west Florida continental shelf observed with long-term moorings. Geophysical Research Letters, 36, L19610, doi:10.1029/2009GL040028. See the citations of this paper [Weisberg et al. 2009] in Google Scholar.